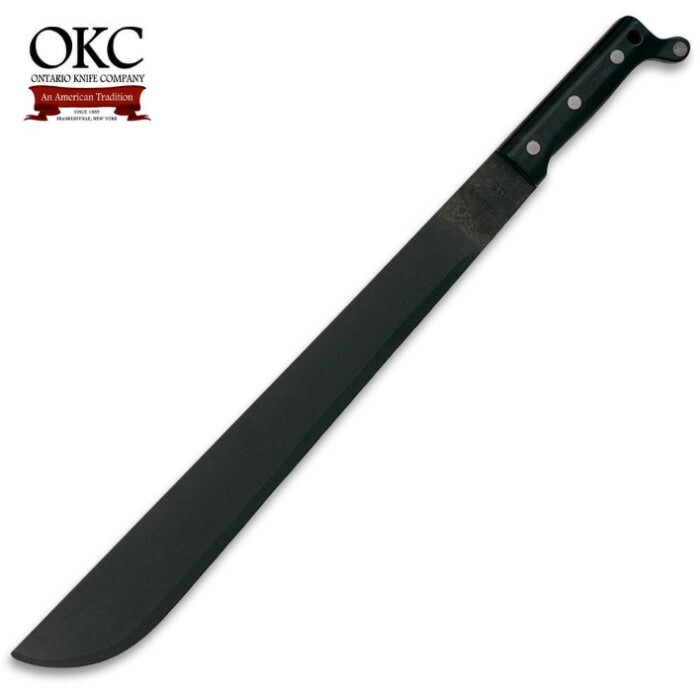 Ontario 18 Inch Military Machete | BUDK.com - Knives & Swords At The Lowest Prices! Best Machete I've ever owned. Solid blade that does not break and gets the job done. It however does not come with a sheath. The handle rivets have fallen apart yet the blade is one solid work of metal art. The sharpness one can get is truly dangerous. I barely brushed the blade and got cut. Great for tropical garden work. I would rate this machete a 10! Someday I vowed to get an 18" US Army machete, or as close to it as possible, to replace the 1942 WW II machete from my Dad's service time. I no longer have the original but this is very close. I put it in an olive drab-army green molle sheath and it is perfect for me. I'll hang it on the basement wall and be content. We have owned this machete for over 30 years and just used it yesterday to "crack" open a dried coconut. While several rivets have failed the blade is intact and we can still make a razor sharp edge. The best I've seen in machetes! Need to buy new rivets and will use it for another 30 years. Great Machete! I have owned and used many other machete's, this one is easily the toughest. Cuts through like an axe! It is heavy sturdy and tough, and be very careful it's high carbon steel gives it a mean sharpness! Just ask my thumb! Anyway a great machete for years of use. I have used a lot of types and brands of machetes over the years. This one is the best. There are quite a few good machetes, but none have ever quite matched this one. If you need a good machete for yard work, travel, or as a general use big blade for outdoors use, this is the one. Get it.